Tony Brasunas grew up at Claymont, an intentional spiritual community in West Virginia, attended Milton, a large public high school in Atlanta, and graduated from Amherst, a small New England college. His writings have appeared in many newspapers and magazines. 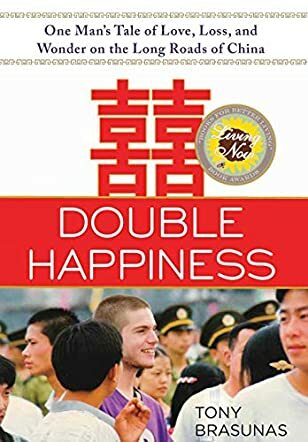 DOUBLE HAPPINESS, his first book, has won numerous 2014 awards, including Best Memoir at the Paris Book Festival, ForeWord Travel Book of the Year Silver Winner, and Best Travelogue at the Indie Excellence Book Awards. When he's not writing, he's hiking or running, working in solar energy, playing guitar, or traveling in a faraway land with his wife. He lives in Alameda, California. Like Tony Brasunas, I have always nurtured a penchant for traveling and learning about the lives of other people, whether near or far. Autobiographies, biographies, memoirs, travelogues and adventure stories have ever been my cup of tea. Brasunas’ Double Happiness: One Man’s Tale of Love, Loss, and Wonder on the Long Roads of China is an absolute delight from the Prologue to the Epilogue. With a curiosity for travel, languages and Chinese in particular, Tony sets off on an exciting adventure to teach English at the Peizheng Middle School in Guangzhou. He begins the school year minus manual or guidance, yet he bravely embraces his undertaking to “not only teach English,” as the principal says, but “to uplift the nation” and inspire his eager charges. Not only does young Brasunas accomplish his mission, in my humble opinion, he uplifts and inspires this reviewer as I move through the school year with him, and follow him across the vastness of China with a backpack, a willing spirit and a loving heart. I loved that Tony opened his heart to Michiko and Lu Lan, even as he wondered about the possibilities of pregnancy and disease, and that he owned up to his fears (that he would fall ill in China and that he feared war and the needless death of innocents). Brasunas’ Double Happiness: One Man’s Tale of Love, Loss, and Wonder on the Long Roads of China is poetry nestled beautifully in prose. An example of his eloquence is as follows: “I’ve been in this land, this empire, this hulking city, a whole week, but everything still scares me and exhilarates me---just breathing what’s in the dirty air, eating what’s on the bountiful plates, wandering through the crowded, crumbling streets.” The narrative throbs with a joie de vivre. The chapter titles are creative and vibrant. I enjoyed learning Chinese, losing myself in the book’s luscious details, visiting the Great Wall, Tibet, Tiananmen Square, the Bingmayong, the Wei River Valley and the Great Mosque of Xi’an, etc. The maps, quotes and illustrations at the beginning of each chapter add a deeper appreciation of the work. The theme that “Travelers ineluctably live in the now” is wholly true in this reviewer’s humble opinion. As a former English teacher, I relished Brasunas’ imaginative assignments, and I loved that he maintained a journal and that one of his students anonymously wrote him notes, evaluating his teaching. Lauren, Byron, Anton, Paige, Chantal and Michiko’s stories lend the work a novel quality and the reader realizes from page one that this is a page-turner; read voraciously.